Earlier this week, I posted a write-up of my wishes for this year's tunnel video song over at TrackEmTigers.com. Surprise, suprise -- Auburn didn't accept any of my submissions. Instead, AUHD went the instrumental route for both of their pre-game intro videos this season. I'm a fan. I stumbled across this video today as I was looking for highlights of Auburn's newest commit. This is a video from Lincoln High School in Alabama of Jauntavius Johnson, a 4-star defensive tackle commit, squatting 500 pounds as a high school freshman. UPDATE: According to his high school coach, Jauntavius can now squat just over 600 pounds, benches around 405, and can power clean more than 335 pounds. Wow. If you attended the annual A-Day game in Auburn on Saturday, then you most likely saw this video that aired at halftime that honored last season's SEC Champions. AUHD did a beautiful job of compiling all of the greatest moments from the unforgettable 2013 season. From C.J. Uzomah's game-winning touchdown catch against Mississippi State, to the "Miracle in Jordan-Hare", all leading up to the largest portion included in the video -- the "Kick Six". 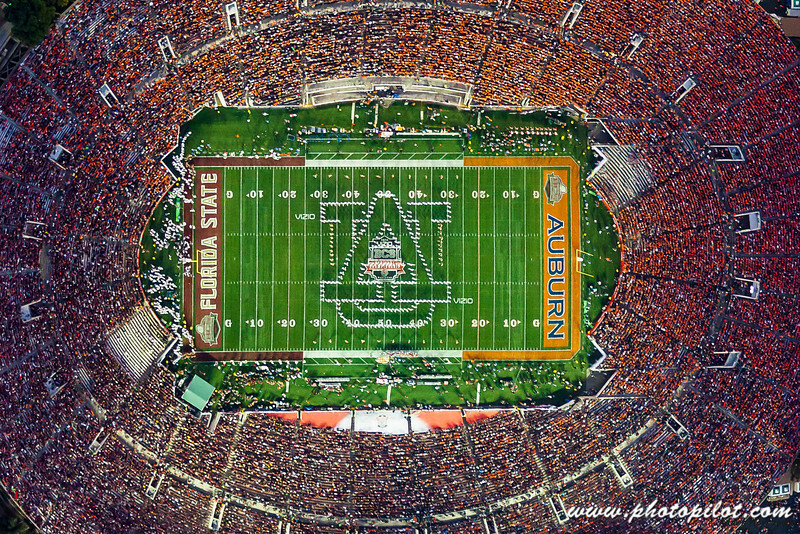 Courtesy of photopilot.com, here are some pretty incredible aerial shots from the 2014 BCS National Championship game last January. Were you there? During every Auburn home basketball game, a lucky student gets the chance to sink a 95-foot putt for a car. To win, you have to hit from one end of the court to the other to fit it through a little hole within a giant cardboard structure. I've been to several Auburn basketball games, and I have never seen anyone get remotely close to the hole, let alone put it through. @AMarkG1 @seniorbowl @FootballAU no, no I won't. Can @dee_ford_ who seems 2 be a US footballer PLEASE tell his followers that I am not him!! @DianeKelley4 er... not me. I have no idea who the dee ford you're talking about but i'm not him!!! @dee_ford 100 percent serious! We're always trying to reach new fans. If you scroll through her Twitter feed today, you'll find her interacting with multiple Auburn fans overseas. She seems to be a good sport about the whole situation, and she was even live-tweeting on Signing day as the LOI's were rolling in. So would you look at that, Auburn seems to be connecting the world, one Brit at a time. As Jay Jacobs promised, Dee received her shipment of Auburn gear today, along with a personal letter (seen below) from the athletic director himself. Looks like we've added our newest member of the Auburn family. War Eagle, Dee! The hometown-kid from Auburn High, Rashaan Evans, announced his commitment and eventually signing with Alabama today. Details and rumors are still swirling around that he told the Auburn coaching staff and its players that he would be enrolling at Auburn, which could be why Auburn commits, Stephen Roberts and Jakell Mitchell attended the announcement. You know what they say about rumors, but after seeing this video and the surprised and stunned looks of the Auburn coaching staff, I'm not too sure what to think. This angle will show us a good shot of the reactions from Coach Dameyune Craig and Kodi Burns in the "war room" on Wednesday morning. If you haven't seen this video of one of Auburn's newest signees from the 2014 class, then you're in for a real treat. Here's offensive guard signee, Braden Smith, bench pressing his max of 515 pounds three times. No, that is not a typo. Yes, I said 515. His spotters look absolutely helpless. Well, this will be laughed at for years to come. Auburn's official website posted the bio for #1 OLB Rashaan Evans just minutes before his announcement in the gymnasium at Auburn High. Not sure of the reasoning behind this one, but they sure did get my hopes up. UPDATE: Auburn is now saying that all bios are pre-built, but not password protected. So that means that you cannot find the profile just by navigating the website, but instead have to have the direct link. Question is, how did that link get leaked? The Big 12, along with Kansas State's athletic department, has announced that the Auburn - Kansas State game will be played on a Thursday night (Sept. 18). The meeting between the two schools will be a "return" matchup for Auburn since Kansas State visited the Plains in the 2007 season opener, which resulted in a 23-13 win for the Tigers. Next year's game will be the fourth meeting in history between the two programs, and the first trip to Manhattan (KS) since the 1978 season. Auburn holds the series record, 3-0. Even though the location isn't ideal, and the game is on a Thursday night, I still expect the Auburn faithful to have a strong turnout in Bill Snyder Stadium this fall. The game will be broadcast nationally on ESPN. Last night at the "Iron Bowl of Basketball", Gus Malzahn and the 2013 Auburn Tigers football team accepted the Foy-ODK trophy, which is presented to the winner of the Iron Bowl, the matchup between Auburn and Alabama. The presentation began with a highlight video of the 2013 game, which of course ended with Chris Davis' 109-yard field goal return, to a standing ovation from the crowd. Gus Malzahn would then stand front-and-center to the Auburn Arena crowd to accept the Foy-ODK trophy for the first time in his career as head coach. The Alabama SGA president was not able to make the trip due to "weather conditions" (excuses, excuses), as it is tradition for the SGA president of the losing team's school to sing the fight song of the winning team's school. Don't worry, we can wait for the ice to clear. Gus Malzahn praised the fans, the athletic department, and most importantly... the players, as he said, "They helped us win a lot of games toward the end, obviously the Iron Bowl was big. And I'm here to tell you, this trophy, it's going to be around here a while. War Eagle." Another year, another championship for Aubie the Tiger, as he won his eighth UCA National Championship on Friday night. Aubie's eight victories of this award are the most of any other mascot in the country. He has won the title in 1991, 1995, 1996, 1999, 2003, 2006, and 2012. Aubie beat out Minnesota's Goldy Gopher (last year's winner) to take the title back to the Plains. Here is this year's routine that consists of an adaptation of Rod Bramblett's call of the "Kick Six" as Aubie trots down an Auburn-themed monopoly board. "They're not gonna keep him from passing go tonight!" Congratulations to Aubie the Tiger on another championship year. 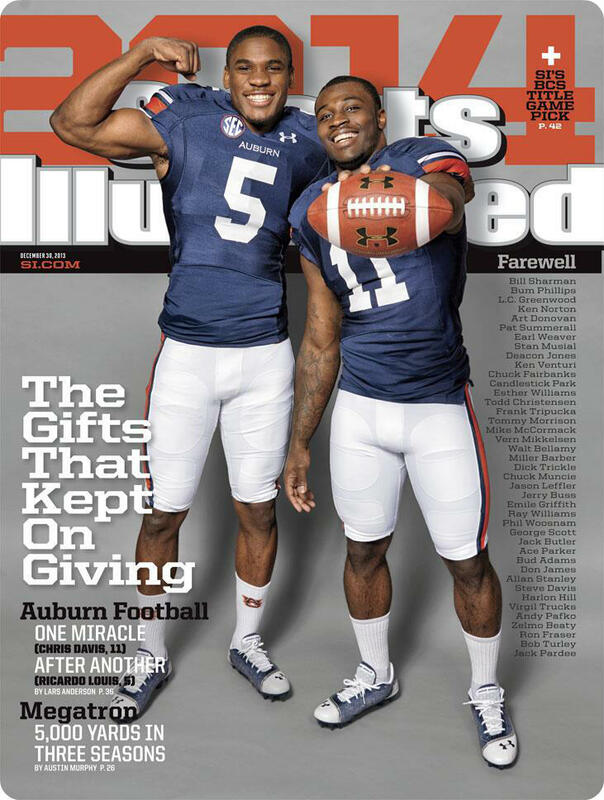 The two key players behind the two "miracles" in Jordan-Hare, Ricardo Louis and Chris Davis, will grace the cover of this week's issue of Sports Illustrated. This will be the third time Auburn players have appeared on the cover in a four-week span. Here was the first issue featuring Chris Davis, the week after the Iron Bowl, and here was the second issue featuring Auburn DB Ryan White with FSU QB Jameis Winston. Here is the most recent, and probably the best, Auburn video of the year. "Snowday Productions" brings us a variety of sound bites, video highlights, and pure awesomeness to deliver one collective chill shivering down our spines. Please comment below if you have any information as to who created this video, because I personally want to give them a big 'ole hug.